As we approach Holy Week and Easter, I invite you to remember Jesus riding into Jerusalem on a donkey and to meditate on that unusual event. It will tell you a lot about Jesus – what he was like and how he understood his own life and death. On Palm Sunday Jesus knew he would be killed in Jerusalem. He made his plans carefully to ride into the city on a donkey, accompanied by his followers. 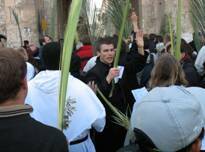 On Palm Sunday Jesus decided to act out this prophesy for everybody to see. He was humble: he came without an army, without money; he had no influence with the authorities. He rode on a donkey, not on a horse which was the animal of war. He was peaceful, he did not resort to violence. Yet he made it clear that he came as a king or leader who would be victorious. For three years he had called on people to trust in God as an incredibly loving Father, and to love and serve one another. Now at the very time that this message was being rejected, and the authorities were planning to have him executed, he publicly proclaimed that his way of love would be victorious. Jesus lived out this prophesy in the days that followed. He pleaded with Judas but used no force against him. He made no resistance when he was arrested; he did not defend himself against his accusers. He did not seem to be victorious when the chief priest and scribes mocked him on the cross, “He saved others, he cannot save himself.” Yet the words that were written on the cross – though they were written to express the charge against him – announced that he was “The King of the Jews.” When Jesus rose from the dead, his followers remembered Palm Sunday and they knew that he was king and that his way of love was, and would be, victorious. 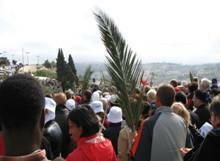 What Jesus did on Palm Sunday, he continues to do in his faithful followers. This may seem strange to you. But I invite you to think of people you know who remind you of Jesus riding into Jerusalem on a donkey. They may never have ridden on a donkey, but they are like Jesus in their humility and gentleness, and in the courage and confidence with which they face the challenges in their lives. I think of an elderly man who died some years ago; he faced his final illness with faith, and arranged that his funeral would be simple and without show; he said, “Where I hope to go, show doesn’t count for anything.” Like Jesus riding into Jerusalem, he was humble and confident. I think of people in many parts of the world who are persecuted for their religious beliefs or on account of their work for justice, and yet stand firm. 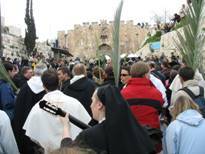 Humbly, non-violently and courageously they imitate Jesus as he rode into Jerusalem on a donkey on Palm Sunday.